Go get slaughtered and we promise you a long and pleasant life. Although the Government-General's description of the state's new notion is deceptively simple-we formerly had too many people, and now we do not have enough-this reconceptualization of the Korean people as an object of study and intervention had profound and in some ways ironic repercussions that may be appreciated by first considering what Michel Foucault has called "bio-power" and "governmentality. "2 According to Foucault, a fundamental transformation in the exercise of power over the lives and deaths of populations emerged in the eighteenth century and then took hold in the nineteenth. In an older historical moment, as typified by the rule of a transcendent sovereign, power over life and death had operated primarily through a negativity. The sovereign exercised his power through the right to kill-or, put the other way, by allowing subjects to live. But particularly from the nineteenth century on, this old right came to be complemented by one with exactly the opposite character. In contrast to the negative logic of the right to take life, the new mode of power, which Foucault called bio-power, is exercised by making others live-by a productive or positive logic. This bio-power is a "power that exerts a positive influence on life, that endeavors to administer, optimize and multiply it, subjecting it to precise controls and comprehensive regulations. "3 Thus power comes to be concerned with matters such as mortality rates and the ratio of births to deaths. It targets living human beings, gathers knowledge about them, constitutes them in their aggregate as populations, and then seeks to enhance their health, sanitation, birthrate, longevity, and so on. It makes them live and prosper through such measures as public hygiene, charitable institutions, welfare funds, old age pensions, insurance, urban planning, and more. Population became a political problem and a target of regulation. Furthermore, while prior to the 1930s there had been surveys of the Korean people and their customs, reports on laborers, examinations of limited numbers of Korean bodies, and so on, even as late as the final years of the war the colonial government still found itself scrambling to put Korean household registers in order. In other words, the colonial state had not established one of the first foundations for constituting the population into the foremost object of government-namely, a technology to account for it, to know it. The state could not even determine the precise number and whereabouts of Korean people living in the colony, let alone in Manchuria, metropolitan Japan, China, and elsewhere. Such facts and figures, and many more that could be cited here, indicate that while there may have been some ambiguity about whether the Korean people were understood as a population worthy of education, life, health, reproduction, and happiness, for most of the colonial period the great masses of the Korean people were more outside than inside the regime of governmentality and bio-power. Or, put differently, they were included in the sense of being largely placed in the zone of exclusion. In practice, power was still exercised primarily in its negativity-by the power to take life and by a strategy of limiting or suppressing the activities of those deemed dangerous, such as communists and ethnic nationalists. Through most of the colonial period, Japanese colonialism operated primarily through the racialized exclusionary logic of colonial difference; at best, it allowed what might be called "zones of indifference" or "undecidability," in which Koreans might be allowed to languish, starve, or even die-or, conversely, through which a few might pass into the inside.13 Here it is also important to keep in mind that, as Foucault explains, "killing" does not "mean simply murder as such, but also every form of indirect murder: the fact of exposing someone to death, increasing the risk of death for some people, or, quite simply, political death, expulsion, rejection, and so on":14 in other words, acts deducting from life. With regard to these "zones of indifference" or "undecidability," my point is that ambivalence about the necessity of nurturing a native educated elite and a reliable pool of laborers led to uneven and limited incorporations of specifically targeted segments and individuals within the Korean population into the apparatuses and institutions associated with modern governmentality. But the Korean people as a whole was not constituted as a "population" in the Foucauldian sense-that is, as an entire population whose individual and aggregated lives could be considered objects of positive intervention and regulation. However, once the logic of total war transformed the population problem into one of lack, the policies of the metropolitan and colonial governments toward their colonial subjects in Korea began to shift dramatically. Now, like "metropolitan Japanese" (Naichijin), Koreans were to be made to live. They were to be targeted as living human beings and constituted in their aggregate as a major subpopulation, and the purpose of government would be to enhance their health, sanitation, birthrate, longevity, education, and general well-being. I do not mean to suggest that the efforts to enhance the lives of Koreans made by the colonial authorities equaled the measures taken for the metropolitan Japanese population. And of course various social services offered them, including medical care, were on the whole far inferior to those available in the metropole. Nor did this transformation result in the disappearance of sheer power in its negativity-that is, the right to take life, as exercised directly by the emperor's officials, the police, and laws. Nevertheless, what we can perceive in an abundance of official documents and policies of the period, especially from 1937 on, is a new commitment to improve the health, education, and welfare of the Korean people. Whether the intentions of colonial administrators and others serving in unofficial organizations supporting the state were noble or sincere does not concern me here. For now, it is enough to note that they acted as if their charge was to work harder to nurture the lives of the Korean people and that when they noted improvements in indices measuring the health, wealth, and happiness of the Korean people, they argued for the necessity of doing more. And what about the matter of racism or discrimination? Foucault is again suggestive. Under the bio-political regime, racism-understood both narrowly and most broadly as discrimination against all those considered inferior in a normalizing society-operates in the determination of who must live and who must die. It creates caesuras as it fragments the biological field of the human to identify threats to the population, whether internal or external. It distinguishes between those who will foster the life and welfare of the population, and therefore must be made to live, and those who hinder the life and welfare of the population and must be made to die. It necessitates the killing or expulsion of those considered threats so that the population can thrive. In the face of war, a determination had to be made about how to locate Koreans in relation to the Japanese metropolitan population. Were they to be considered a threatening Other that had to be kept apart from the metropolitan core of the Japanese population, treated like slaves and exposed to death, or even exterminated in the manner of the Nazi Holocaust? Or were Koreans to be reconstituted as a subpopulation worthy of being made to live because they could help foster the life and welfare of the metropolitan Japanese population? There was no absolute resolution of this problem, but as the population shortage in Japan and its colonies came to be felt with increasing acuity through the war years, the ruling elite accelerated the demand that Koreans be made to live and prosper as a part of the Japanese population. The war years, in other words, were a transitional moment in the passage of Koreans from the outside to the inside of the "Japanese" population, a shift managed by the logics and technologies of bio-power and governmentality. Hence as the war progressed it became increasingly imperative to disavow racist feelings toward Koreans. And paralleling this passage from the outside to the inside we find a transformation in the type of racist discrimination against Koreans-that is, a movement from an unabashed and exclusionary "vulgar racism" to a new type of inclusionary and "polite racism" that denied itself to be racist even as it operated as such. The same report also commended Koreans for their service with the police. The Government-General, realizing the obvious utility of employing men who shared the same language and "thoughts" as the common Korean people, had employed a large number of Korean policemen (junsa). As of October 1937, Koreans numbered 7,203 out of 17,067 policemen in Korea.23 It admitted that because of the limited term of their training (four months) and their "traditional living environment" (seikatsu kanky≈ç), these policemen did not meet metropolitan Japanese standards of self-discipline, responsibility, and active engagement in their duties. However, it also noted recent improvements in their performance-so dramatic that some had been awarded the "highest honor available to policemen, the Distinguished Service Medal." Thus, by the end of 1937, support for the voluntary soldier system had overcome remaining resistance from some of the central military authorities, leading to the War Ministry's 15 January 1938 announcement that the army would be opened to Korean volunteers. The Army Special Volunteer System Law (rikugun tokubetsu shiganheirei) was promulgated as an imperial ordinance (No. 95) on 22 February 1938, and went into effect on 3 April 1938, thus making it possible for Korean "male imperial subjects seventeen years and older" to volunteer for service in the army.25 Taiwanese became eligible to volunteer for the army from April 1942 on.26 The military did not accept Korean or Taiwanese volunteers into the navy until the Navy Special Volunteer Law (Imperial Ordinance No. 608) went into effect on 1 August 1943. This law enabled males sixteen to twenty years of age from both colonies to volunteer for most but not all positions within the navy.27 Kond≈ç Masami has argued that two factors help explain the general reluctance of the navy to accept volunteers until 1943. In comparison to the army, the navy did not have as great a manpower need until this late date. And, interestingly, like the U.S. military, which resisted allowing Japanese Americans to serve in the navy, the Japanese navy was concerned about the ease with which only a few untrustworthy elements could sabotage entire ships.28 While the Japanese navy overcame this reservation, the U.S. Navy continued to be closed to Japanese Americans through the entire war. The army's voluntary system had been instituted in Korea with the intent of possibly extending military conscription to the colony at some time in the distant future, but the Pearl Harbor attack accelerated these efforts. On 8 May 1942, the Japanese cabinet passed a resolution approving extension of the military draft to Korea, and through Law No. 4 (which was promulgated 1 March 1943 and went into effect on 1 August 1943) the government revised the Military Service Law (heieki-h≈ç) to make enforcement of conscription in Korea possible.30 The decision to implement military conscription in Taiwan followed soon thereafter, as the cabinet approved this resolution in September 1943.31 As a result, the Japanese military began to conscript Koreans beginning in 1944, and Taiwanese in 1945. One other relatively small but significant group of Korean and Taiwanese soldiers should be mentioned-namely, "student soldiers." In October 1943 the Japanese government (through Imperial Ordinance No. 755) suspended student deferments for conscription, primarily as a measure to increase the pool of potential military officers. Exceptions continued to be made for those studying in fields deemed essential to the military effort, such as medicine, science, and engineering, but students in the faculties of law and letters could no longer have their service deferred.35 Korean and Taiwanese students were not subject to this change in the law; and in order to mobilize them for the same purpose, the War Ministry implemented the Army Special Volunteers Extraordinary Induction Regulations (rikugun tokubetsu shiganhei saiy≈ç kisoku). Promulgated and put into effect on 20 October 1943, these regulations legally enabled Korean and Taiwanese students enrolled in higher education to volunteer for the army. Most would otherwise have fallen into a gap, as the earlier Army Special Volunteer System was closing down and they exceeded the age requirement (twenty) for the upcoming draft. Under these regulations the Government-General accepted volunteers from 25 October to 20 November of the same year, and those deemed acceptable entered the army on 20 January 1944. About 70 percent (4,385 out of 6,203) of those eligible under these regulations joined.36 No comparable path existed for colonial students to volunteer for the navy. Thus, from modest beginnings in the first years of the Army Special Volunteer System to the enforcement of conscription in 1944 and 1945, Korean male youths came to play an extraordinarily large role in the Japanese war effort. By the end of the conflict they were serving in almost all types of units in both the army and navy; and based on the numbers given above-16,830 army volunteers, 3,000 navy volunteers, 190,000 army and navy conscripts, and 4,385 student army volunteers-it is possible to arrive at a rough estimate of more than 214,000 Korean men who served as military personnel in the Japanese armed forces between 1938 and 1945. Scholars tend to agree that the colonial government conceived of the volunteer system not only as of direct importance, in providing military manpower, but also as part of a broader spiritual campaign known as "imperial subjectivization" (k≈çminka), which was intended to constitute the Korean people into loyal subjects of the Japanese emperor.37 The k≈çminka campaign centered on four major reform programs: religious reforms that sought to replace other religions with Shinto, educational reforms that emphasized Japanization of the spirit and Japanese-language education, the coerced replacement of Korean and Taiwanese names with Japanized ones, and the inclusion of colonial subjects in the military forces. In general, this campaign of assimilation to Japaneseness is usually understood as seeking to extinguish the unique cultural life and traditions of the colonized peoples-or in the often-used expression, to "obliterate the [Korean] ethnos" (minzoku massatsu). And within this context, the policy of enlisting colonial subjects into the military is generally explained as an attempt to demonstrate to Koreans and Taiwanese that the Japanese regarded them as their equals, even when they did not. Given the extreme gap between the actual conditions in which most of the Korean people lived and the extent of the military's as well as the central and colonial government's apparently outrageous claims that Koreans were completely equal to the metropolitan Japanese, it is not difficult to understand why scholars and many others have dismissed the Japanese rulers' pronouncements as simply duplicitous. However, what we might call the "argument of obvious duplicity" is insufficient in at least two respects. First, it posits an unchanging Japanese racism that is immune to transformations in the historical conditions of which it was a part. Second, such a limited view does not take into consideration the unintended effects of issuing pronouncements on equality, even if such a campaign might have begun with purely utilitarian and duplicitous purposes. For instance, the military, central, and colonial authorities determined that in order to make the campaign for the inclusion of Koreans into the military a success, not only would they need to convince the Korean people that the emperor and the nation regarded them as their equals, but it would also be necessary to impress upon the metropolitan Japanese that the Koreans were a trustworthy and loyal people. Between 1938 and 1945, the military authorities and their counterparts in the colonial and central governments targeted their propaganda at Japanese officials throughout the civil and military bureaucracies, and at the great masses of Japanese people scattered throughout the empire, just as much as at the Korean people. As we will see more fully in later chapters, in addition to propaganda intended for Koreans, mainstream Japanese newspapers, magazines, radio, literature, and even movies conveyed the veracity of Korean and metropolitan Japanese equality to the metropolitan Japanese. Even as the ruling elite may have been duplicitous-in the sense that it most surely maintained discriminatory attitudes toward Koreans while deploying a language and programs of equality-it also became caught up in the discourse of equality it promoted. As some of the most interesting recent literature on European colonialism has argued,38 even as the Japanese metropole sought to remake its colonies, it was constantly being remade by those same imperial projects. Colonial policies that deployed the discourse of equality may have begun with utilitarian intent; but that discourse could not be neatly contained so as to make it both believable to the colonial subjects and a transparent lie to the colonizers. A considerably different reality from that offered by the argument of obvious duplicity will emerge as we reframe our problematic, moving attention away from the question of the sincerity of intentions and toward the effects of the disavowal of racist discrimination. More than ever before, especially in the post-1937 era, the conditions of total war released a set of contradictory discourses and practices regarding race or ethnicity that enveloped colonizers and colonized alike, both those who considered themselves unproblematically Japanese and those who sought to become Japanese. Once the official position of the national and colonial regimes dramatically shifted for practical reasons to that of the fundamental equality of Koreans and Japanese, the authorities had no choice but to act as if they truly believed in the discourse of equality. This acting as if had real-life effects, including pressure to enact concrete changes in policies regarding the management of Koreans-not only in the military but throughout the empire. In the end, the ruling elite contributed to the production and circulation of an emerging racial common sense that made it increasingly difficult to openly espouse vulgar racist views, to appear unconcerned about the health and welfare of the Korean people, and to ignore Korean desires for greater political rights. To be sure, both before and after the mobilization of Koreans as soldiers, many officials continued to resist treating them as equals and harbored anxieties about the consequences of practices that seemed to break down the distinction between the two peoples. Even after the volunteer system had been in place for several years, Japanese military and government officials still often discussed Koreans as aliens. For example, in its immediate post-Pearl Harbor study of "national strength in human resources," the Ministry of War's Military Preparations Section continued to write about the Japanese people in terms of the Yamato ethnos and about others within the colonial empire as "outside peoples" (gaichi minzoku). In arguing that Japan's military manpower and civilian labor needs could not be met by the Yamato ethnos alone, it clearly considered the Korean people and other colonial subjects as ethnic groups external to the core Japanese population, or on the outside of what it called "our people" (waga minzoku).42 Koreans and other outside peoples had to be mobilized, it said, but it did not suggest that the Koreans themselves might be considered part of the population worthy of life and security. One of the most unequivocal official statements of the absolute necessity of maintaining the rigid line of separation between the Japanese people and their colonial subjects can be found in the 1943 study that I touched on briefly in my introduction: namely, An Investigation of Global Policy with the Yamato Ethnos as Nucleus (Yamato minzoku).43 The authors of the study displayed their extreme anxiety about the tension between the need to mobilize the empire's human resources for the war effort and the desire to keep the different groups apart. With regard to Koreans and Taiwanese-not unlike U.S. eugenics discourse then current, in which fears of the Other's hyperfecundity exacerbated anxieties about racial contamination-the report claimed that these people not only were unassimilated but also reproduced at an alarmingly rapid rate. Taiwan and Korea occupied important positions as "supply bases" (heitan kichi), but they had to be prevented from becoming like "parasites within a lion" (shishi shinch≈´ no mushi), meaning that they should not be allowed to bring harm to their mighty host. To be sure, even as it denounced discrimination and claimed to recognize Korean inclusion in the core Japanese population, the emerging discourse on Koreans as a part of the Japanese people tended to describe the Korean people as still lagging behind the metropolitan Japanese. While it predicted that all distinctions between Koreans and the metropolitan Japanese would eventually fade away, in the meantime Koreans were to be treated as essentially but not yet actually equals. This was a kind of historicist logic that, as Dipesh Chakrabarty has put it for another context, consigned others to "an imaginary waiting room" of history. In other words, it was a way of telling the Korean people "not yet"56-and it resulted not in the disappearance of racism but in the constitution of a new kind of discrimination that reproduced hierarchies through a discourse on cultural character and catching up, even as it strongly denounced ethnic or racial discrimination and gestured toward inclusion. Yet, as we will also see, the very logic of historicism opened up an avenue for increasing numbers of exemplary individuals to slip out of the waiting room and to claim themselves ready to be treated as full-fledged Japanese. And the incessant pressure of meeting the demands of total war led to the piecemeal, if far from complete, dismantling of the waiting room itself. 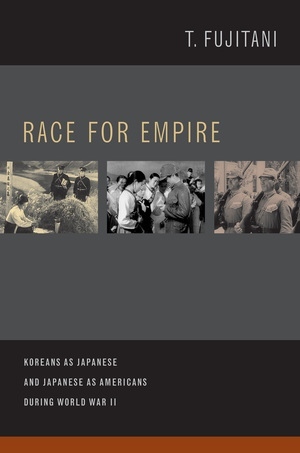 The text begins with a dramatic prologue that emphasized, as the official slogan went, "the equality of all under the emperor's benevolent gaze" (isshi d≈çjin), the rising self-consciousness of Koreans as imperial subjects, and the possibility that these Koreans might have a special mission in making Greater East Asia a reality. While it is often assumed today that the "Japanese" reserved the leading place in East Asia for themselves alone, with other imperial subjects having a "proper place" below them, the prologue declared that these soldiers from Korea should be allowed to fulfill their weighty mission "as members of the leading race of Greater East Asia" (Dait≈ça no shid≈ç minzoku no ichiin toshite; emphasis added). 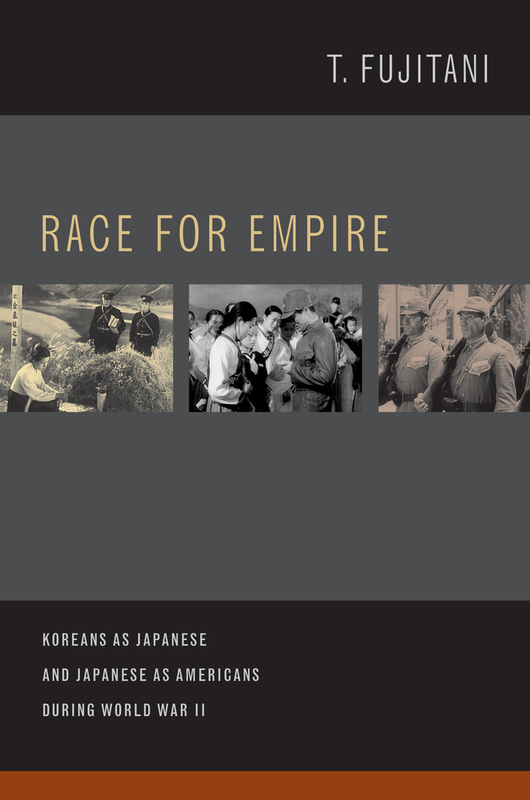 Race for Empire offers a profound and challenging reinterpretation of nationalism, racism, and wartime mobilization during the Asia-Pacific war. In parallel case studies—of Japanese Americans mobilized to serve in the United States Army and of Koreans recruited or drafted into the Japanese military—T. Fujitani examines the U.S. and Japanese empires as they struggled to manage racialized populations while waging total war. Fujitani probes governmental policies and analyzes representations of these soldiers—on film, in literature, and in archival documents—to reveal how characteristics of racism, nationalism, capitalism, gender politics, and the family changed on both sides. He demonstrates that the United States and Japan became increasingly alike over the course of the war, perhaps most tellingly in their common attempts to disavow racism even as they reproduced it in new ways and forms. T. Fujitani is the Dr. David Chu Professor in Asia-Pacific Studies and Professor of History at the University of Toronto. He is the editor of Perilous Memories: The Asia Pacific War(s) and is the author of Splendid Monarchy: Power and Pageantry in Modern Japan (UC Press).